"I love the beadwork on Kelly's necklace, with the fun play of the colors inversed. What a clever way to interpret the trellis pattern of this month's inspiration. 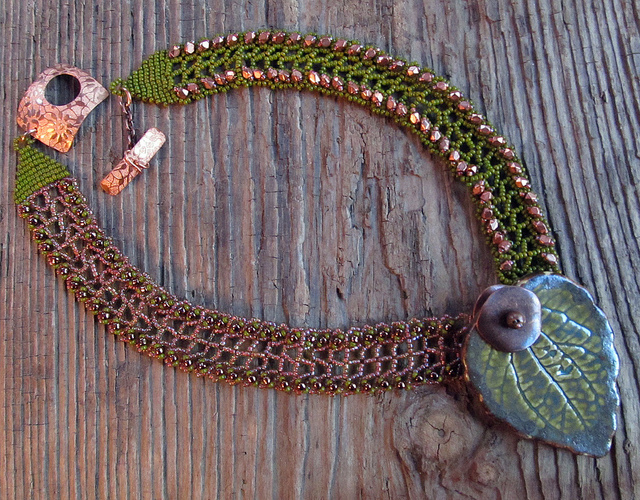 The pendant is the perfect focal for the graphic beaded backdrop and the clasp fits in perfectly with the design elements of the beadwork, echoing the copper colored glass beads." There is still time to join the challenge. The blog entry deadline is January 29th and the last day to enter for this month's prize drawing is January 31st. Read the complete challenge rules here. Oh, this is lovely, and creative, and a perfect response to this month's challenge! So very nicely done! This is truly scrumptious! Well done! Gorgeous! What a pretty way to incorporate the trellis design into a necklace! Congrats Kelly! the bead work is stunning.